From the author of stunning debut The Mourning Hours comes a powerful new novel that explores every parent's worst nightmare... The Kaufmans have always considered themselves a normal, happy family. Curtis is a physics teacher at a local high school. His wife, Kathleen, restores furniture for upscale boutiques. Daniel is away at college on a prestigious music scholarship, and twelve-year-old Olivia is a happy-go-lucky kid whose biggest concern is passing her next math test. And then comes the middle-of-the-night phone call that changes everything. Daniel has been killed in what the police are calling a "freak" road accident, and the remaining Kaufmans are left to flounder in their grief. The anguish of Daniel's death is isolating, and it's not long before this once-perfect family finds itself falling apart. As time passes and the wound refuses to heal, Curtis becomes obsessed with the idea of revenge, a growing mania that leads him to pack up his life and his anxious teenage daughter and set out on a collision course to right a wrong. 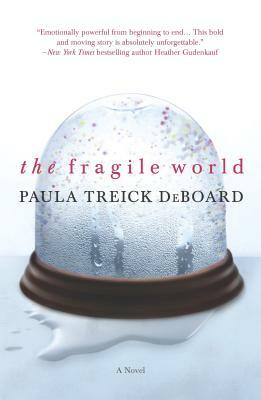 An emotionally charged novel, The Fragile World is a journey through America's heartland and a family's brightest and darkest moments, exploring the devastating pain of losing a child and the beauty of finding the way back to hope. "Heart-stopping. A gripping read that delivers a beautiful reminder of the resilience of love." --Karen Brown, author of The Longings of Wayward Girls.